By “indications” generally, I mean the motions and applications of the hands, legs, and whip, to direct and determine the paces, turnings, movements, and carriage of the horse. I have used the word throughout instead of “aids”, as being more explanatory and certainly less liable to abuse. For common sense tells us that a horse receives no aid from a pull in the mouth with a piece of iron, or a blow with a whip, or a kick in the side with an armed heel, however these may indicate to him the wishes or commands of his rider. I have also used the term “bearing”on the horse’s mouth instead of “appui”, since to those who do not understand French appui will convey no meaning at all,–and to those who do understand French it will convey the false ideas of the necessity and power of the rider to “support” his horse. I promise my pupil every “aid” and “support from” his horse. But I beg him not to think of offering either aid or support “to” his horse. I beg him to believe that the horse carries the rider, and not the rider the horse. But this we will discuss in another chapter. That the horse supports the rider is common sense: that the rider supports the horse is the common error. In chapter 10, on colt breaking, the author suggests that one should patient, forgiving and put off the dreaded evil: Force. Furthermore he goes on to suggest that expecting submission from the colt, or “ seeing no necessity to give up their will to yours” affects motivation or results in “indisposition to go freely forward”. The whole affair of colt-breaking is an affair of patience, you cannot have too much forbearance: put off the evil day of force. Forgive him seventy times seven times a-day, and be assured that what does not come to-day will to-morrow. The grand thing is to get rid of dogged sulks and coltishness; of that wayward, swerving, hesitating gait, which says,“here’s my foot, and there’s my foot;” or, “there is a lion in the street, I cannot go forth.” This is the besetting sin of colts; and this it is which, on the turf, gives so great an advantage to a young horse to have another to “make play”, or “cut out the running” for him. For this indisposition to go freely forward results as well from their seeing no necessity to give up their will to yours, as from their incapacity to perceive and obey the indications of their rider without swerving, shifting the leg, &c., and additional labour to themselves. All this is spared to the young horse by the follow-my-leader system. The next snippet is wonderful! The colonel advices that at all costs the colt must not be alarmed and the trainer should refrain from using force. Great advice really! He goes on to suggest that one should gradually…induce familiarity and cheerful obedience, basically to reduce stress caused by separating the colt from his group or band. Everything should be resorted to avoid alarm on the colt’s side and force on the man’s, and gradually to induce familiarity and cheerful obedience–to reconcile him to the melancholy change from gregarious liberty to a solitary stall and a state of slavery. I should say that he is the best colt-breaker who soonest inspires him with the animus eundi–who soonest gets him to go freely straight forward–who soonest, and with least force, gets the colt without company five miles along the road from home. Violence never did this yet; but violence increases his reluctance, and makes it last ten times longer. Indeed, it causes the colt to stiffen and defend himself, and this never is got rid of. It is true that by force you may make him your sullen slave, but that is not the object; the object is to make him your willing subject. Above all things, do not be perpetually playing the wolf to him; deal in rewards where it is possible, and in punishment only where it cannot be avoided. Be assured that the system will “answer”. Yes one can use force by perpetually playing the wolf to him, but this will only lead to a sullen slave instead of a willing subject, the latter being achieved by dealing rewards and avoiding the use of punishment. It is, no doubt, our duty to create the happiness and to prevent the misery of every living thing; but with our horse this is also a matter of “policy”. The colt should be caressed, rubbed, and spoken to kindly. He should be fed from the hand with anything he may fancy, such as carrot, or apple, or sugar, and be made to come for it when whistled to or called by name. While doing some reading and research on early horsemanship methods, I came across a little gem of a book written by Kinkaid and Strutzman (1856): “The Arabian Art of Taming and Training Wild and Vicious Horses”. This book is filled with interesting notes and ways to go about the horse, but one should not forget the context in which the book was written. Prevailing worldviews and our understanding of the complexities of life have changed considerably since then, at least in some places. Founded on the Leading Characteristics of the Horse. FIRST.–That he is so constituted by nature that he will not offer resistance to any demand made of him which he fully comprehends, if made in a way consistent with the laws of his nature. SECOND.–That he has no consciousness of his strength beyond his experience, and can be handled according to our will, without force. THIRD.–That we can, in compliance with the laws of his nature by which he examines all things new to him, take any object, however frightful, around, over or on him, that does not inflict pain, without causing him to fear. I must admit, I thought the three principles were brilliant! The remainder of the text is equally interesting, and you will find some areas of the text high-lightened. Interesting bits are mingled together with “just so” stories, so be prudent and critical in your reading, but enjoy! To take these assertions in order, I will first give you some of the reasons why I think he is naturally obedient, and will not offer resistance to anything fully comprehended. The horse, though possessed of some faculties superior to man’s being deficient in reasoning powers, has no knowledge of right or wrong, of free will and independent government, and knows not of any imposition practiced upon him, however unreasonable these impositions may be. Consequently, he cannot come to any decision what he should or should not do, because he has not the reasoning faculties of man to argue the justice of the thing demanded of him. If he had, taking into consideration his superior strength, he would be useless to man as a servant. Give him mind in proportion to his strength, and he will demand of us the green fields for an inheritance, where he will roam at leisure, denying the right of servitude at all. God has wisely formed his nature so that it can be operated upon by the knowledge of man according to the dictates of his will, and he might well be termed an unconscious, submissive servant. This truth we can see verified in every day’s experience by the abuses practiced upon him. Any one who chooses to be so cruel, can mount the noble steed and run him ’till he drops with fatigue, or, as is often the case with more spirited, fall dead with the rider. If he had the power to reason, would he not vault and pitch his rider, rather than suffer him to run him to death? Or would he condescend to carry at all the vain imposter, who, with but equal intellect, was trying to impose on his equal rights and equally independent spirit? But happily for us, he has no consciousness of imposition, no thought of disobedience except by impulse caused by the violation of the law of nature. Consequently when disobedient it is the fault of man. Then, we can but come to the conclusion, that if a horse is not taken in a way at variance with the law of his nature, he will do anything that he fully comprehends without making any offer of resistance. Second. 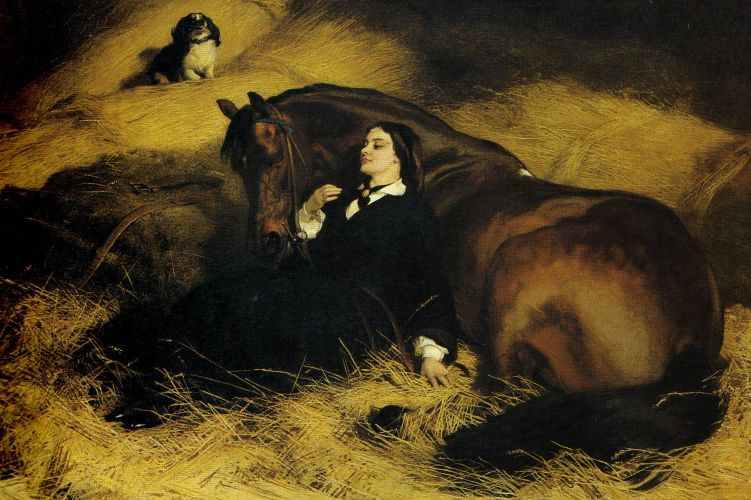 The fact of the horse being unconscious of the amount of his strength, can be proven to the satisfaction of any one. For instance, such remarks as these are common, and perhaps familiar to your recollection. One person says to another, “If that wild horse there was conscious of the amount of his strength, his owner could have no business with him in that vehicle; such light reins and harness, too; if he knew he could snap them asunder in a minute and be as free as the air we breathe;” and, “that horse yonder that is pawing and fretting to follow the company that is fast leaving him, if he knew his strength he would not remain long fastened to that hitching post so much against his will, by a strap that would no more resist his powerful weight and strength, than a cotton thread would bind a strong man.” Yet these facts made common by every day occurrence, are not thought of as anything wonderful. Like the ignorant man who looks at the different phases of the moon, you look at these things as he looks at her different changes, without troubling your mind with the question, “Why are these things so?” What would be the condition of the world if all our minds lay dormant? If men did not think, reason and act, our undisturbed, slumbering intellects would not excel the imbecility of the brute; we would live in chaos, hardly aware of our existence. And yet with all our activity of mind, we daily pass by unobserved that which would be wonderful if philosophised and reasoned upon, and with the same inconsistency wonder at that which a little consideration, reason and philosophy would be but a simple affair. Thirdly. He will allow any object, however frightful in appearance, to come around, over or on him, that does not inflict pain. We know from a natural course of reasoning, that there has never been an effected without a cause, and we infer from this, that there can be no action, either in animate or inanimate matter, without there first being some cause to produce it. And from this self-evident fact we know that there is some cause for every impulse or movement of either mind or matter, and that this law governs every action or movement of the animal kingdom. 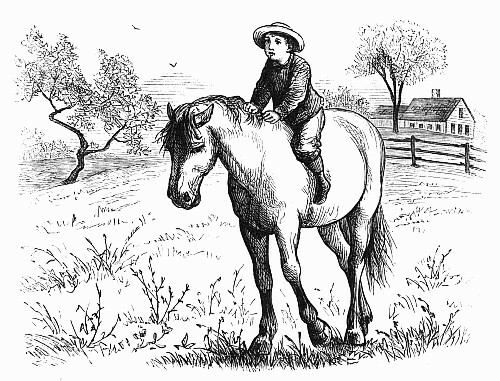 Then, according to this theory, there must be some cause before fear can exist; and, if fear exists from the effect of imagination, and not from the infliction of real pain, it can be removed by complying with those laws of nature by which the horse examines an object, and determines upon its innocence or harm. A log or stump by the road-side may be, in the imagination of the horse, some great beast about to pounce upon him; but after you take him up to it and let him stand by it a little while, and touch it with his nose, and go through his process of examination, he will not care anything more about it. And the same principle and process will have the same effect with any other object, however frightful in appearance, in which there is no harm. Take a boy that has been frightened by a false-face or any other object that he could not comprehend at once; but let him take that face or object in his hands and examine it, and he will not care anything more about it. This is a demonstration of the same principle. Powel’s System of Approaching the Colt. Powell says, “A horse is gentled by my secret, in from two to sixteen hours.” The time I have most commonly employed has been from four to six hours. He goes on to say: “Cause your horse to be put in a small yard, stable, or room. If in a stable or room, it ought to be large in order to give him some exercise with the halter before you lead him out. If the horse belong to that class which appears only to fear man, you must introduce yourself gently into the stable, room, or yard, where the horse is. He will naturally run from you, and frequently turn his head from you; but you must walk about extremely slow and softly, so that he can see you whenever he turns his head towards you, which he never fails to do in a short time, say in a quarter of an hour. I never knew one to be much longer without turning towards me. “At the very moment he turns his head, hold out your left hand towards him, and stand perfectly still, keeping your eyes upon the horse, watching his motions if he makes any. If the horse does not stir for ten or fifteen minutes, advance as slowly as possible, and without making the least noise, always holding out your left hand, without any other ingredient in it than that what nature put in it.” He says, “I have made use of certain, ingredients before people, such as the sweat under my arm, etc., to disguise the real secret, and many believed that the docility to which the horse arrived in so short a time, was owing to these ingredients; but you see from this explanation that they were of no use whatever. The implicit faith placed in these ingredients, though innocent of themselves, becomes ‘faith without works.’ And thus men remained always in doubt concerning this secret. If the horse makes the least motion when you advance toward him, stop, and remain perfectly still until he is quiet. Remain a few moments in this condition, and then advance again in the same slow and imperceptible manner. Take notice: if the horse stirs, stop without changing your position. It is very uncommon for the horse to stir more than once after you begin to advance, yet there are exceptions. He generally keeps his eyes steadfast on you, until you get near enough to touch him on the forehead. When you are thus near to him, raise slowly, and by degrees, your hand, and let it come in contact with that part just above the nostrils as lightly as possible. If the horse flinches, (as many will,) repeat with great rapidity these light strokes upon the forehead, going a little further up towards his ears by degrees, and descending with the same rapidity until he will let you handle his forehead all over. Now let the strokes be repeated with more force over all his forehead, descending by lighter strokes to each side of his head, until you can handle that part with equal facility. Then touch in the same light manner, making your hands and fingers play around the lower part of the horse’s ears, coming down now and then to his forehead, which may be looked upon as the helm that governs all the rest. “Proceed in the same progressive manner to the sides, and then to the back of the horse. Every time the horse shows any nervousness return immediately to the forehead as the true standard, patting him with your hands, and from thence rapidly to where you had already arrived, always gaining ground a considerable distance farther on every time this happens. The head, ears, neck and body being thus gentled, proceed from the back to the root of the tail. “This must be managed with dexterity, as a horse is never to be depended on that is skittish about the tail. Let your hand fall lightly and rapidly on that part next to the body a minute or two, and then you will begin to give it a slight pull upwards every quarter of a minute. At the same time you continue this handling of him, augment the force of the strokes, as well as the raising of the tail, until you can raise it and handle it with the greatest ease, which commonly happens in a quarter of an hour in most horses; in others almost immediately, and in some much longer. It now remains to handle all his legs. From the tail come back again to the head, handle it well, as likewise the ears, breast, neck, etc., speaking now and then to the horse. Begin by degrees to descend to the legs, always ascending and descending, gaining ground every time you descend until you get to his feet. “Talk to the horse in Latin, Greek, French, English, or Spanish, or in any other language you please; but let him hear the sound of your voice, which at the beginning of the operation is not quite so necessary, but which I have always done in making him lift up his feet. Hold up your foot—’Live la pied’—’Alza el pie’—’Aron ton poda,’ etc., at the same time lift his foot with your hand. He soon becomes familiar with the sounds, and will hold his foot up at command. Then proceed to the hind feet and go on in the same manner, and in a short time the horse will let you lift them and even take them up in your arms. At the turn of the last century, a horse named Hans was thought capable of complex intellectual tasks such as arithmetic, reading, spelling, telling time and even understanding the German language. Hans, der Kluge Hans, or clever Hans as he is more commonly known, was owned by a Mathematics teacher from Berlin, Wilhelm von Osten. 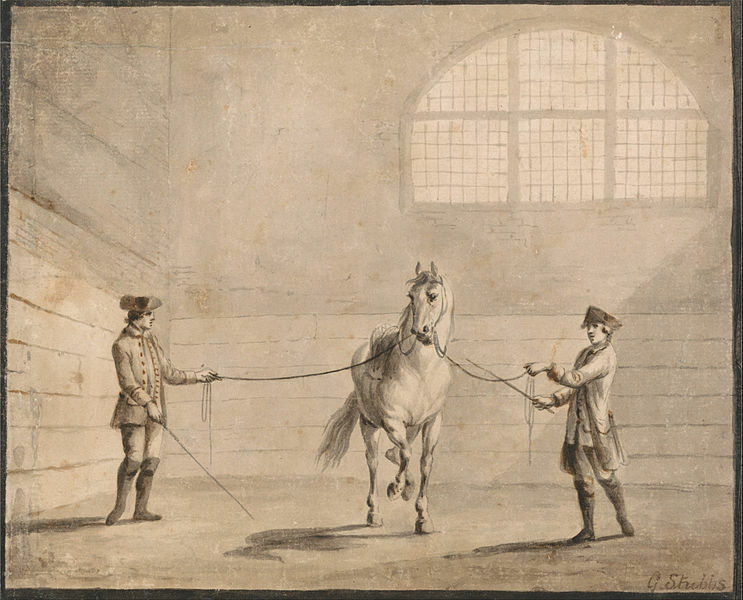 During four years of careful and deliberate instruction, von Osten went to great lengths to educate his equine pupil and understand the horse’s expressions: (…) “his chief mode of expression was tapping with his right forefoot. Hans also expressed himself by means of movements of the head; thus “yes” was expressed by a nod, “no” by a deliberate movement from side to side; and “upward,” “upper,” “downward,” “right,” “left,” were indicated by turning the head in each particular direction” (Pfungst, 1911). However, Hans counted-out most of his answers by tapping his forefoot on the floor appropriate number of times. Numbers were simply tapped-out, so 7+3 would be tapped 10 times. Von Osten had encoded the alphabet as “A”=one tap; “B”=two taps and so forth, assigning numbers to letters. The horse spelled out answers to questions by tapping its hoof the number of times corresponding to each letter, forming words and sentences. For this task the crafty mathematician had (…) “translated a large number of concepts into numbers.” (Stumpf, 1911) The letters of the alphabet in small German script, where arranged on a chart, with numbers below them indicating the row, and the place occupied by the letter in any particular row. Tones of the musical scale were taught using a small child’s organ with the diatonic scale C^1 to C^2. For teaching colour discrimination a number of coloured cloths were used. Von Osten who had never charged a penny for his demonstrations, was dismayed at the accusation of fraud from the press and appealed to the local school board to investigate the veracity of the horse’s ability as well as the viability of his teaching methods. The German Department of Education urged by von Osten himself, put together a commission, known as the Hans Commission. This group, led by the Philosopher and Psychologist Professor Carl Stumpf, were called together to investigate (…) ” whether or not there is involved in the feats of the horse of Mr. von Osten anything of the nature of tricks, that is, intentional influence or aid, on the part of the questioner.” (Pfungst, 1911) The Hans Commission was comprised of a Circus Manager (Paul Busch), a Count (Otto zu Castell-Rüdenhausen), Teachers (Dr. A. Grabow; Robert Hahn), Zoologists (Dr. Ludwig Heck; Dr. Oscar Heinroth) a Veterinarian (Dr. Miessner), retired Military (Major F. W. von Keller; Major General Th. Köring) and Physiologist (Prof. Nagel), amongst some others. Regardless of the questions the multi-disciplinary commission presented Clever Hans, the horse was able to correctly answer. The commission had no choice but to inform the masses and the media, that no trickery was involved in the feats of the ever cleverest Hans. However the actual origin of the abilities of Hans were not tackled, and they suggested the likeliness that other factors were involved, which ought to be carefully investigated. It was at this point that Stumpf assigned the task of further investigation to his student Oskar Pfungst. Following the September, 1904 commissions findings The New York Times ran an article on Clever Hans – Berlin’s Wonderful Horse: He Can Do Almost Everything but Talk – How was he taught? The popularity of Clever Hans was now an international sensation attracting even more interest than before. Dr. E. von Hornbostel, Mr. O. Pfungst and Professor Stumpf investigated the likely origins of the “clever” accomplishments of Hans, through an experimental method. Hans was questioned in a variety of ways and the experimental set-up was modified several times. Hans failed in his responses whenever the solution of the problem that was given him was unknown to any of those present. When objects to be counted or numbers written on a paper where placed before Hans, he failed in response if either the examiner or anyone else had not seen the objects or the numbers scribbled on the paper. It was thus clear that Hans needed visual aid to solve the problems. If Hans was not in sight of person and especially the questioner, to whom the solutions were known, he gave an incorrect reply. These visual aids which guided Hans, need not be given intentionally. To explain the outcome of the investigation, it was suggested by Stumpf (1911) that the horse had learned to closely attend to the slight unconscious changes in bodily posture of Von Osten, whilst tapping with the forefoot. In the end an explanation was found to the origin of the remarkable abilities of the Clever Hans. 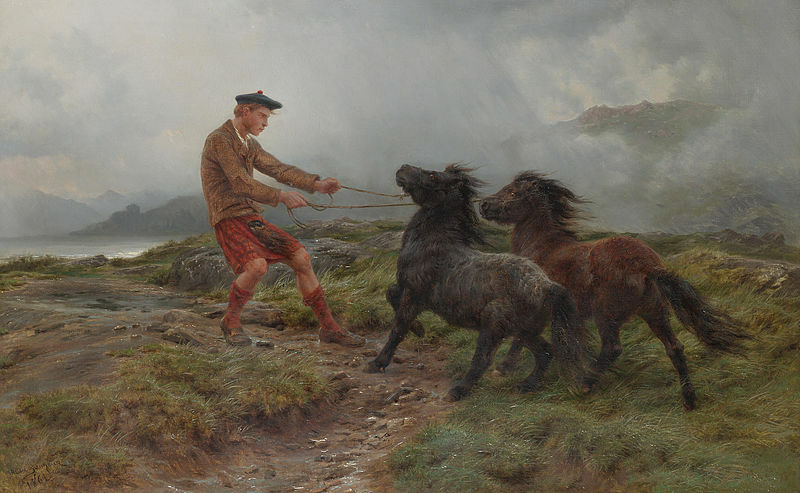 Hans had no need for telepathy or even critical thinking: he was using his uncanny perception as a horse to detect even the involuntary physical responses of von Osten as well as that of the questioners. Hans had learned to identify subtle tensing and relaxing of muscles that occur in someone who is anticipating the correct answer. Thus, Hans would tap his hoof until he saw the subconscious twitch in observers who knew he had arrived at the right spot in the alphabet, and there Hans would stop, oblivious to the semantic content of his actions. Wilhelm Von Osten never really accepted the Clever Hans explanation, so he and his horse continued to put on their math-and-body-language show throughout Germany for some time, eventualluy ceasing their public performances. Wilhelm von Osten passed away in 1909, and Hans was tranferred to a farm and later sold to jewelry tycoon Karl Krall of Elberfeld. Hans was again in the spotlight in Eberfeld and performed with two other horses; Muhamed and Zarif. Today, the “Clever Hans Effect” is used to describe the influence of a questioner’s subtle and unintentional cues upon their subjects, in both humans and in other animals, to prevent prejudices and foreknowledge from contaminating experimental results. Thank you Hans, you clever boy! Our horses are, as a rule, sentenced to an especially dull mode of life. Chained in stalls (and usually dark stalls at that) during three-fourths of their lives, and more than any other domestic animal, enslaved for thousands of years by reins and whip, they have become estranged from their natural impulses, and owing to continued confinement they may perhaps have suffered even in their sensory life. A gregarious animal, yet kept constantly in isolation, intended by nature to range over vast areas, yet confined to his narrow courtyard, and deprived of opportunity for sexual activity,—he has been forced by a process of education to develop along lines quite opposite to his native characteristics. Nevertheless, I believe that it is very doubtful if it would have been possible by other methods, even, to call forth in the horse the ability to think. Presumably, however, it might be possible, under conditions and with methods of instruction more in accord with the life-needs of the horse, to awaken in a fuller measure those mental activities which would be called into play to meet those needs. I have put together short video clips and photos from our Los Llanos (Venezuela) expedition-2011 into a mini recompilation. The song ‘The Great Plain‘ is from the Tubular Bells II (1992) album, by Mike Oldfield.